CSIRO and ANU are working with partners and collaborators to create a globally significant research and innovation sciences precinct in Canberra. SIEF is investing in two key elements of this emerging precinct. The Centre for Genomics, Metabolomics and Bioinformatics, a collaborative facility between CSIRO and ANU that aims to revolutionise the conversion of gene discovery to crop deployment and environmental management. It will integrate new with existing infrastructure to provide a ‘one-stop shop’ for an integrated approach to plant breeding and resource management. The emphasis will be on (1) unblocking existing equipment and hardware limitations in the research-to-impact workflow, and (2) building the capacity to convert large, unique data sets into new knowledge through shared development of bioinformatics expertise and capacity. It will enable researchers to relate traits in plants to their biochemistry and to their genes for those many traits that have been beyond contemporary analysis. This will enable more efficient approaches to plant breeding and to understanding the interactions between plants and the other organisms in the environment. 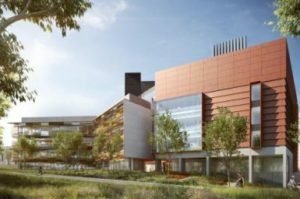 A new life sciences building on the CSIRO Black Mountain campus to ensure that CSIRO’s laboratories, microscopy and analytical facilities support outstanding research excellence. The SIEF funding is part of CSIRO’s $196 M ACT Consolidation Project which is an integral part of the developing precinct in Canberra. This development will provide a major platform for co-location of external collaborators and will complement the extensive infrastructure investments on the ANU campus over the past decade that will house some of the SIEF-funded equipment. The National Agricultural and Environmental Sciences Precinct will bring transformative changes to the way that research and innovation are conducted in the Precinct by fostering integrative and collaborative work patterns; and by enabling joint access to a suite of facilities. This precinct will foster research and innovation essential to food security and environmental stewardship in the face of climate change, population growth and land degradation. It will enable the delivery of new or improved traits crops, with improvements in yields and nutrient profiles. It will provide enabling, innovative solutions to environmental management. It will link with partners in the ACT and will continue to build on its already strong links with Australian and global life sciences companies.